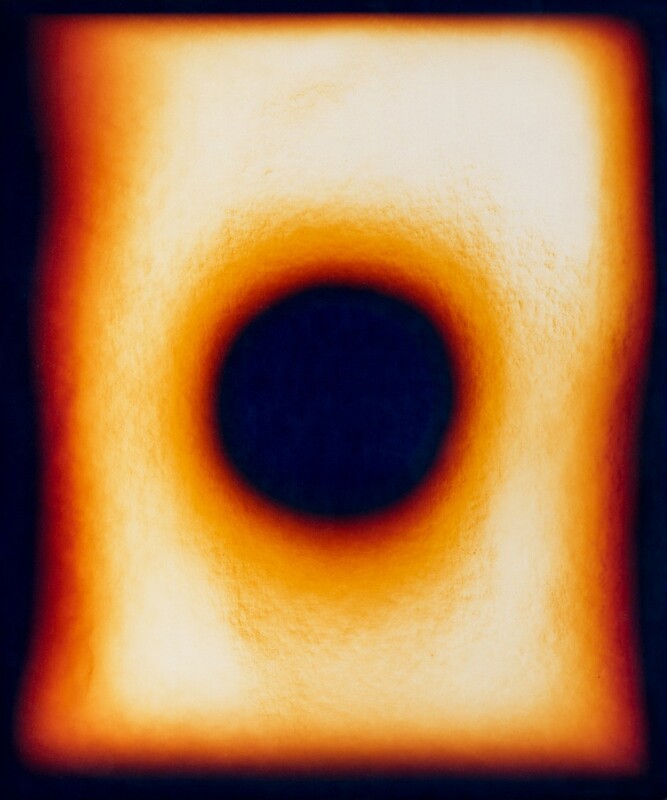 Sungazing 1/108, © Kei Ito, Chromogenic color print made by direct sunlight, 2015 — ongoing. Image courtesy of the artist. Kei Ito’s ritualistic photo-based installations are connected by one catastrophic event: the atomic bombing of Hiroshima on August 6, 1945. 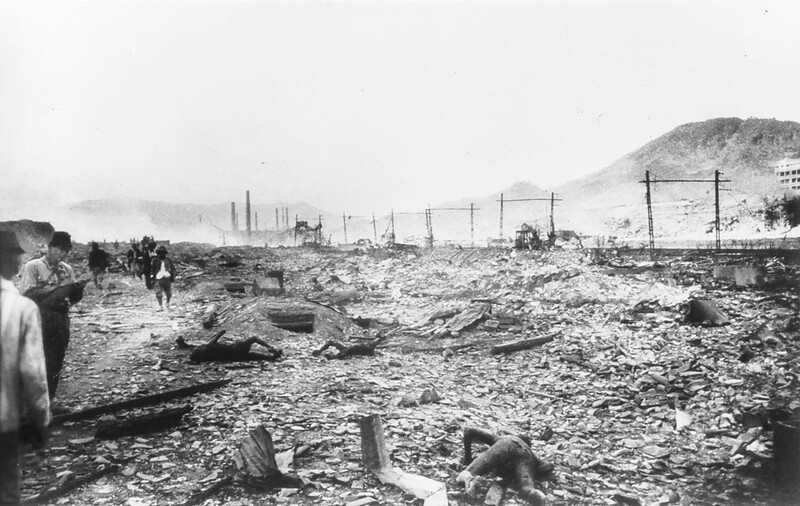 Referring to photographs taken by Yosuke Yamahata in Nagasaki on August 10, 1945, (the morning after the second nuclear attack by the US on Japan), theorist Akira Mizuta Lippit has written that “…what appears without identification, diffused throughout, is radiation — the sign of an invisible death.”¹ Today, Kei Ito and other conceptual artists such as Shimpei Takeda are attempting this same visualization of the invisible — in Ito’s case, the materialization of “the fear of radiation.” His grandfather, Takeshi Ito, survived the August 6 attack; his experience in Hiroshima, and his extensive writing and anti-nuclear advocacy afterward, provide the genesis for all of his grandson Kei’s profound atomic-related artworks. Like Yamahata’s irradiated film and equipment, Takeda’s photographic materials are literally contaminated; he responded to the 2011 meltdown at the Fukushima Daiichi Nuclear Power Plant in Japan by sprinkling soil from the affected landscape onto undeveloped photographic film. 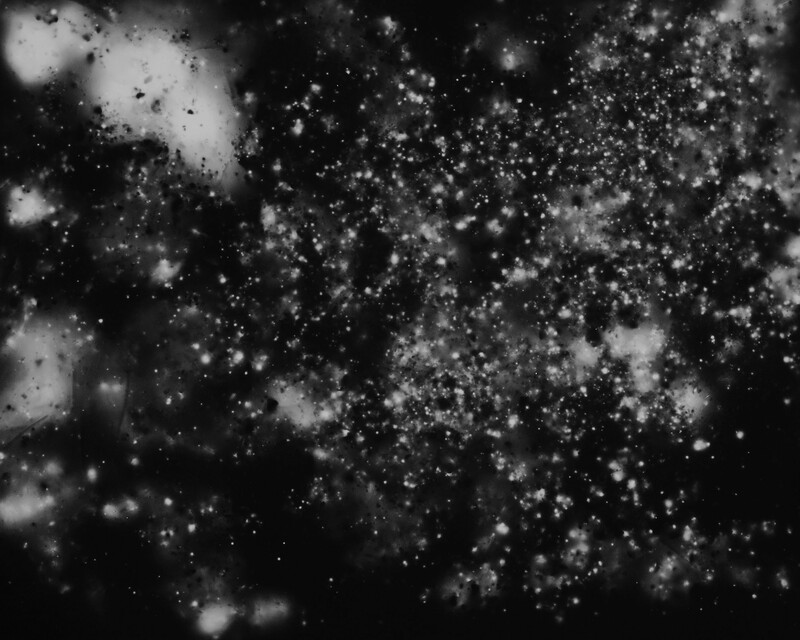 The resulting imprints of light, generated by radioactivity, take on the appearance of stars and constellations in the night sky.² Ito relies on visual metaphor rather than actual radioactive evidence; he interchanges media elements such as a burnt dictionary, scroll, soundscape, and projected imagery throughout the various iterations of Sungazing and other works described here — nothing is fixed except the concept. Sungazing arose from his grandfather’s comment that Hiroshima’s sky was lit as if from “hundreds of suns.” Its recurrent image, multiplied 108 times, is a dark circle, like an eclipsing sun, set within an orange and yellow background. Ito writes that “108 is a number with ritual significance in Japanese Buddhism; to mark the Japanese New Year, bells toll 108 times, ridding us of our evil passions and desires, and purifying our souls.” He recreates the piece — displayed either as a grid or as a scroll — every year as the anniversary of the Hiroshima [and let us not forget, Nagasaki] bombings approaches. 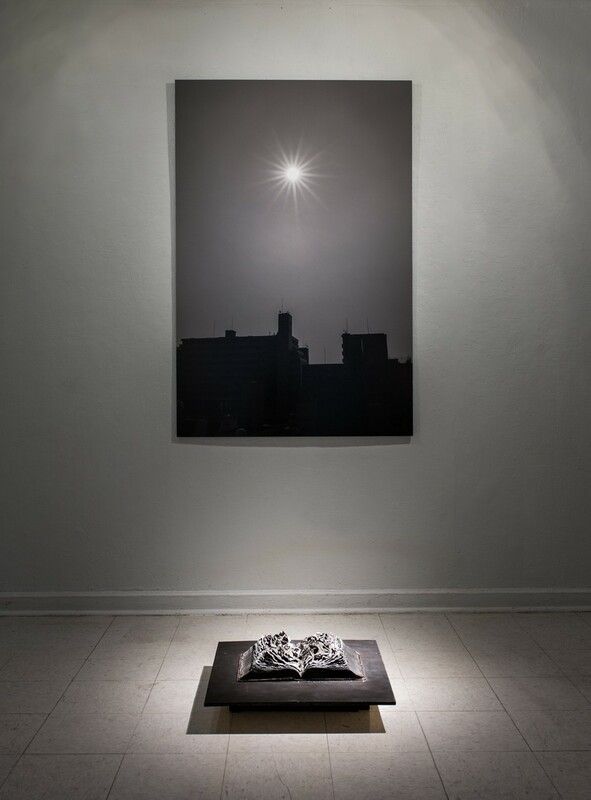 Sungazing, Installation view, © Kei Ito, from the series Sungazing, 2015–ongoing. Chromogenic color print, burnt wood panel, audio. Image courtesy of the artist. Sungazing, © Kei Ito, from the series Sungazing, 2015–ongoing. Chromogenic color print, burnt wood panel, audio. Image courtesy of the artist. 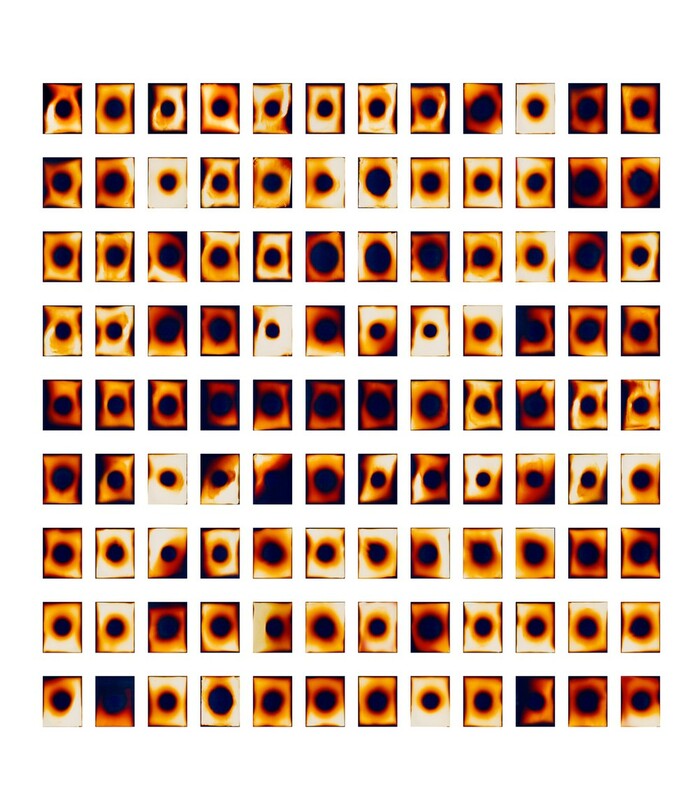 Sungazing employs the physiological traces he shares with his grandfather to mediate the temporal space leading back to Hiroshima: “In a darkened room, I pulled the paper in front of a small aperture to expose it to the sun while inhaling, and paused when exhaling. I repeated this action until I breathed 108 times.” In one version, a 200-foot long scroll, rolled at the top, hangs vertically to the floor. The scroll’s end rests on a burnt-wood etching of Hiroshima’s topography, while at the top a white light pulses insistently. In a voice-over, a first-person narrative written by Ito’s grandfather’s imagines his sister’s death at the moment of the bombing.³ Like many schoolchildren, she was assigned that day to clear fire lanes to help evacuation in the event of American bombing raids, and Ito’s careful intonation vividly conveys the tragedy of her death. Hiroshima 08/06/2015–8:15am, © Kei Ito, 2015. 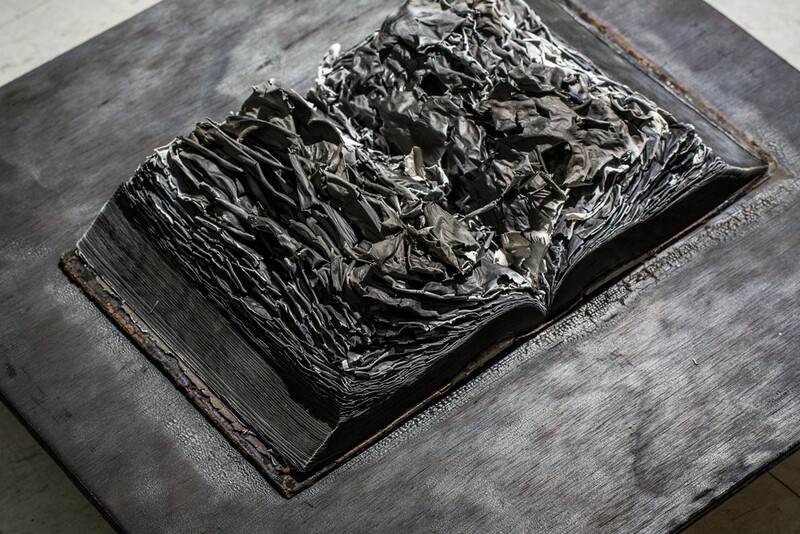 Media: Archival pigment print, Burnt Japanese dictionary. Print: 44x66 in., book: 12x12x5 in. Image courtesy of the artist. Detail: Hiroshima 08/06/2015–8:15am, © Kei Ito, 2015. 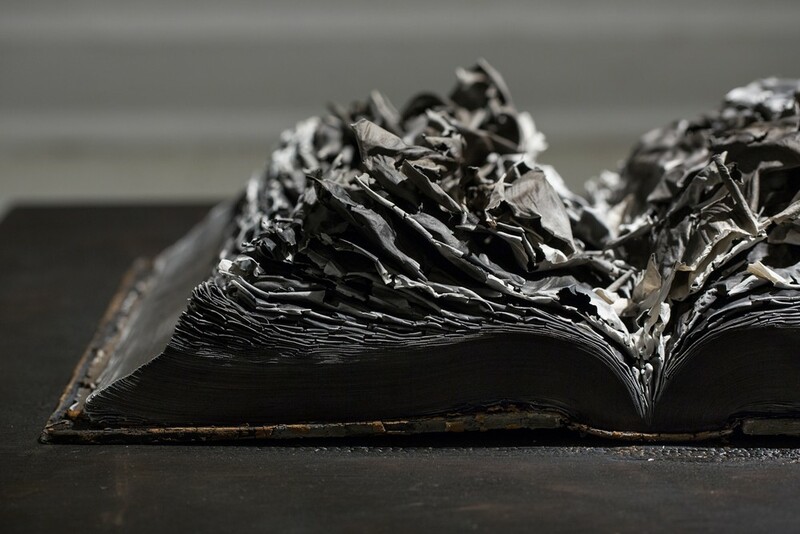 Media: Archival pigment print, Burnt Japanese dictionary. Print: 44x66 in., book: 12x12x5 in. Image courtesy of the artist. Ash Lexicon-Silverplate, © Kei Ito, 2016. Media: Burnt Japanese Dictionary, 108 film canisters, burnt 2x4 in. stud, audio. Image courtesy of the artist. Detail: Ash Lexicon-Silverplate, © Kei Ito, 2016. Media: Burnt Japanese Dictionary, 108 film canisters, burnt 2x4 in. stud, audio. Image courtesy of the artist. The burned dictionary acts as a metaphor for the inability of words to describe such as event (although John Hersey’s 1945 book and essay, Hiroshima, is an unforgettable record of it). Ash Lexicon-Silverplate extends the metaphor to the inscription of atomic radiation onto his grandfather, Takeshi’s, body. 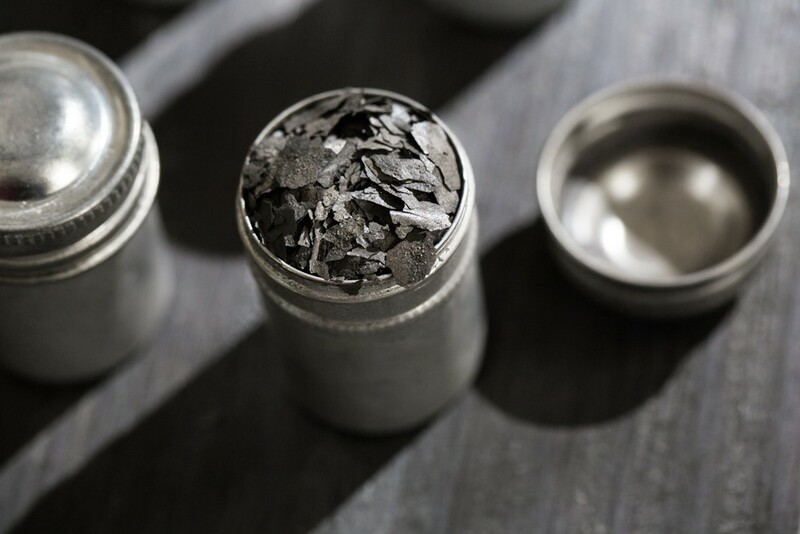 For this piece, Ito has crumbled pages from a burnt dictionary into 108 film canisters that rest on top of two charred, crisscrossed wooden studs. Situated in a darkened gallery space, a single light casts a cross on the floor that resembles the cross-hairs of a gunsight. The canisters and the word “Silverplate” refer to the series name used for the B-29 bombers used in the attacks on Hiroshima and Nagasaki. 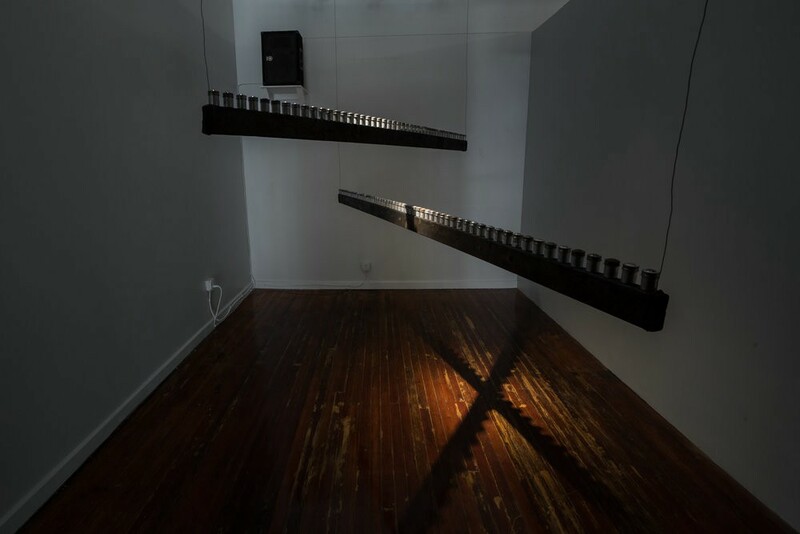 A drone-like soundscape by Andrew Paul Keiper, derived from his thesis work, Manhattan Project, evokes their sound. Ash Lexicon-Silverplate, two-channel audio (composed by Andrew Paul Keiper), © Kei Ito, from the series Ash Lexicon Silverplate, 2016. Video courtesy of the artist. Trace #7 Nihonmatsu Castle, © Shimpei Takeda, 2012, gelatin-silver print. Image courtesy of the artist. Documentary images made in Hiroshima and Nagasaki by Yoshito Matsushige and Yosuke Yamahata respectively serve as an umbilical cord to the immediacy of the atomic attacks, while conceptual works by Shomei Tomatsu, Hiromi Tsuchida, and Ishiuchi Miyako, among others, link us to its uncanny legacy of radioactivity. Shimpei Takeda, Takashi Arai, and other Japanese artists extend the chronology to encompass the 3/11 “Triple Disaster” — the East Japan Earthquake, tsunami, and nuclear meltdown at Fukushima. Beyond those events lies a third catastrophe-in-waiting: today’s political climate. As he describes it himself, Ito’s ritualistic image-making serves as an intermediary between our current era and his grandfather’s heritage of anti-nuclear advocacy. It is something meaningful to contemplate amidst today’s babble of Western xenophobia. Akira Mizuta Lippit: “Photographing Nagasaki: From Fact to Artifact,” in Nagasaki Journey, Rupert Jenkins ed. (San Francisco: Pomegranate Artbooks) 1995. 25–29. 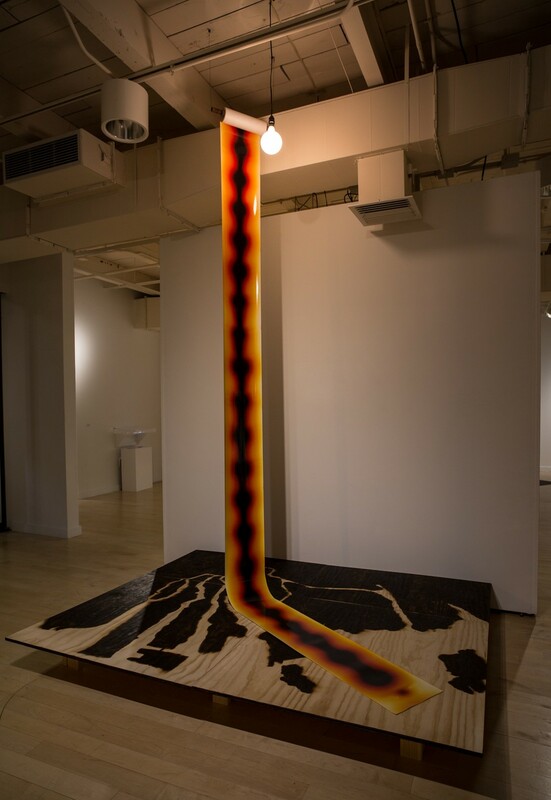 Takeda’s Trace series is included in the New Territory exhibition at the Denver Art Museum through September 16, 2018. The audio was created by Ito from his grandfather’s book Hiroshima Keeps Telling. Kei Ito is based in Baltimore and is a graduate of the Maryland Institute College of Art’s MFA program in photography and electronic media (2016). His works have been acquired by several major institutions, including the Norton Museum of Art, MICA, Center for Photography at Woodstock, and RIT. In 2018 he was a Creative Alliance Artist Residency recipient and the recipient of an Individual Artist Award from the Maryland State Arts Council. Rupert Jenkins is a freelance editor and photography writer/curator. He lives in Denver and is a contributor to onegoodeyeonline.com.